The villa with private swimming pool is only 30 min. from Naples and and situated on the first floor in a private park with guardian. Sea View. The pool is private (photo 2-3-4) for exclusive use of the tenant (mt.13x6 size), it can be used until late in the evening and is equipped with deck chairs, umbrellas, sun beds and water-bike to ride relaxed in the water. Large garden of 2000 sqm. (Photo 5-8-9-10). In the garden, independent and completely fenced for the safety of children and pets, there are pine trees, cycads, lemons, figs, oranges, tangerines, grapes, pears and all the plants typical of Mediterranean cuisine such as rosemary,sage and basil ( for renter ). Access is controlled by an automatic gate. Ample parking (4-5 cars) on the property. 4 bikes available. A spacious porch of 50 square meters. (Photo 06.07.23) for the games like table tennis provided , to relax in the afternoon and at lunch or dinner. Barbecue provided. The villa is an ideal base to visit places of historical, cultural and tourist interest easily accessible due to the lack of traffic and the presence of convenient and nearest motorway ,. - Reggia di Caserta 30 min. - Amalfi Coast 75 min. - Sorrento coast 75 min. The villa is located just north of the city of Naples away from city traffic. And well connected by motorways with all tourist areas. Nearby the property there are several shopping centers such as Conad and Auchan. I am a radiologist. I was born in Naples where I live and I studied and worked. 2 bathrooms in the apartment. 1 bathroom near the pool. All bathrooms have hot and cold water. 1 outdoor shower near the pool with only cold water. In the living room-dining room and in one of the bedrooms. In all rooms there are the fans. Uncovared parking witten the property that you access with automatic gate and can accommodate 4-5 cars. 4 burner gas cooker. Kitchen for the exclusive use of tenants. Possibility to seat 10-12 people a) in the dining room b) in the terrace adjoins the dining room. c) in the terrace communicating with the kitchen. d) in the patio. 2000sqm exclusive use fenced with access gate. They are available to guests garden products (figs, oranges, pears, tangerines, lemons, grapes, oregano, basil, etc.). For the exclusive use of tenants are 4 bicycles. And 'this near the villa a bike path walkable for many kilometers. The necessary maintenance and cleaning of the pool and the garden is provided by the occasional presence of specialized personnel or the owner himself and is free. The pool is open from May to October. Pets allowed. No further costs for house cleaning at end of stay At the request of tenant cleaning staff for the interior of the villa ( additional cost ). Surrounding area a little run down but property excellent. Security gates and private road, property well maintained with very helpful owners. Nearby shopping but limited restaurants. Beach nearby but not particularly attractive. Villa pool excellent. Easy road access to Naples and historic sites. We passed 3 weeks in this wonderful house (6 adults and 6 children). We enjoyed the pool, the garden, the ping pong and the football table. 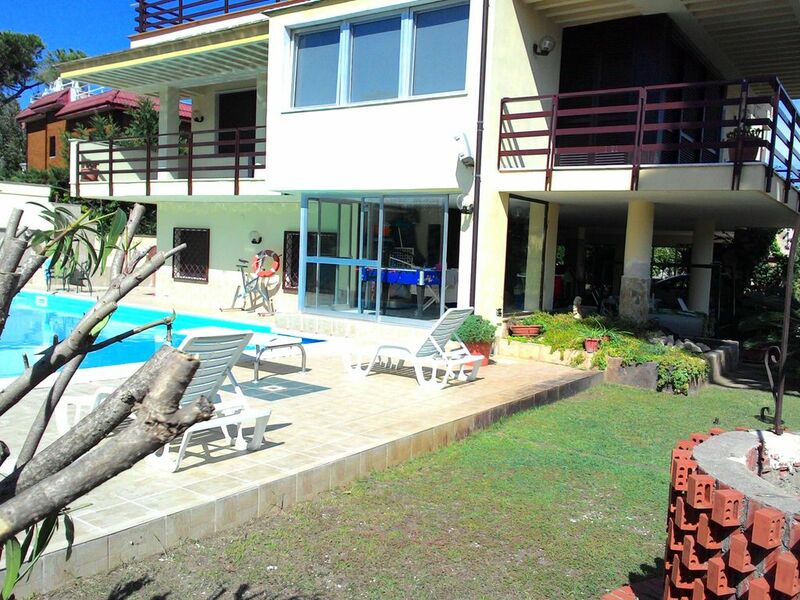 Great house, pristine pool, close to Napoli and a very kind and helpful owner! I recommend it and we will definitely return! The house and pool are fantastic - still warm enough to swim in October. You definitely need a car for this area, especially as a lot of shops are closed at this time of year. The local area was disappointing as said by others, and the nearby beach was very dirty. That did not spoil an otherwise great holiday. It's close enough to get to Pompeii & Herculaneum, and of couse Vesuvius. We recommend the town of Pozzuoli and the ice cream shop as well as the amfiteatro. A good detailed map or GPS are essential to make driving in this area easier. The main roads are accessible and fast. Considering the area, the house is fantastic value and I would recommend it to any other renter. "We''re three families: 6 adults+4 kids. It was enough space for all of us. Very nice, comfortable villa, beautiful yard, very good outdoor facilities (the pool is big and clean). Surroundings are not good (dirty, poor town), but the villa is in a closed private street, so we didn''t feel discomfort. The owners are pleasant and friendly people. We spent wonderful holiday here and will come back again!"